Over the holiday weekend, thousands gathered in Dallas’ Reverchon Park to honor fallen service members and first responders. The Carry the Load Dallas Memorial March is a two day event that helps raise money for the organization’s Continuum of Care partners. The march began at 4:30 p.m., but the two day event also features live music, patriotic speeches, and stories honoring fallen heroes. Carry the Load was founded by two former Navy SEALs as a way to restore the true meaning of Memorial Day and raise money to fund support programs for military, first responders, and their families. Several Dallas Police officers are participating in the march this Memorial Day weekend in remembrance of fallen family, friends, and co-workers. For more information visit, CarrytheLoad.org. Despite rain and a lot of humidity, thousands gathered in Dallas’ Reverchon Park to honor fallen service members and first responders. 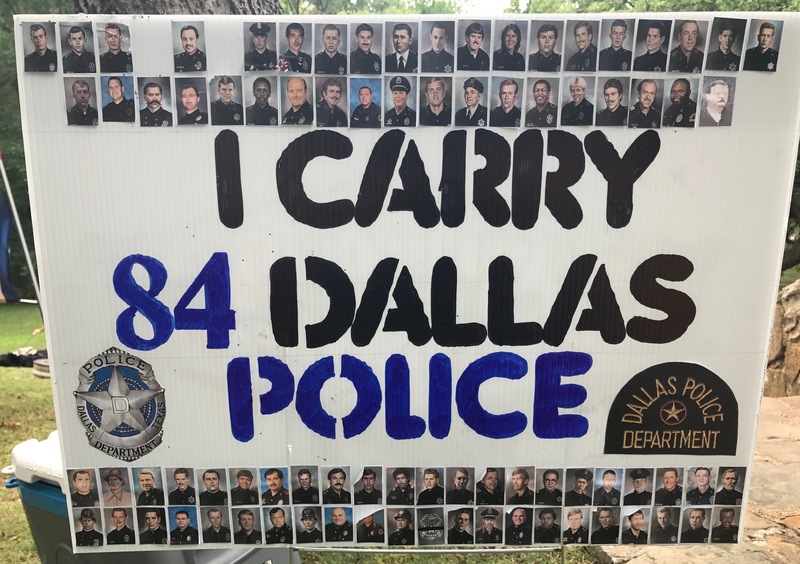 The Carry the Load Dallas Memorial March is a two day event that helps raise money for the organization’s Continuum of Care partners. The march began at 4:30 p.m., but the two day event also features live music, patriotic speeches, and stories honoring fallen heroes. 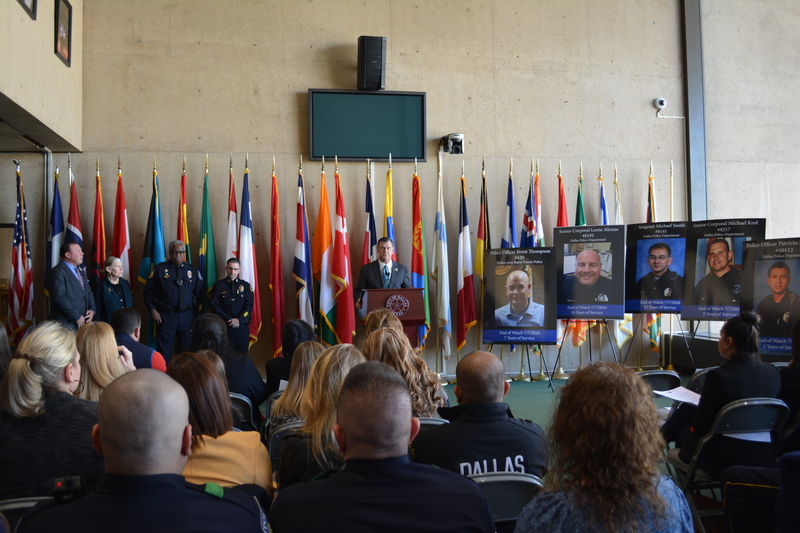 Dallas Mayor Mike Rawlings along with representatives from the Assist the Officer Foundation and The Dallas Foundation announced today that about $10 million was raised for the wounded officers and families of the fallen officers from the July 7, 2016 ambush. Trusts have been created for the families of Dallas Police Department Sergeant Michael Smith, Senior Corporal Lorne Ahrens, Officer Michael Krol, Officer Patricio Zamarripa, and Dallas Area Rapid Transit Officer Brent Thompson. From t-shirt sales and fundraisers to lemonade stands, people across the world felt compelled to show their support for these families. The donations came from individuals from every state in the U.S. and all over the world, including Canada, United Kingdom, Italy, and Australia. Words cannot accurately express the amount of gratitude and pride felt by the members of the Dallas Police Department. When our department, our city, and our country were struck by such a terrible tragedy, the love and kindness that poured out from our community was the only thing that held us together. We will never be able to have our brothers back with us, but we can rest comfortably and continue to do our jobs knowing that their loved ones will be taken care of. Thank you again! The Dallas Police Memorial wall is a tribute to honor the fallen officers of the Dallas Police Department who gave the ultimate sacrifice in the line of duty. Unveiled in May of 2001, this magnificent landmark was commissioned by the Dallas Police Foundation and maintained through an endowment. The memorial occupies a prominent site on parkland adjacent to City Hall in downtown Dallas. The upper portion of the structure was designed to allow sunlight to stream through the steel plates on the underside, which bear the badge numbers of the fallen officers. This allows the sun to shine through and project them onto the asphalt paving below. Today’s ceremony marks the 15th Anniversary at the Dallas Police Memorial site. This ceremony is to preserve the memories of the 80 officers who laid down their lives for the citizens of Dallas. It is also to pay respect to the families who also gave so much. Their memories and sacrifices will never be forgotten. 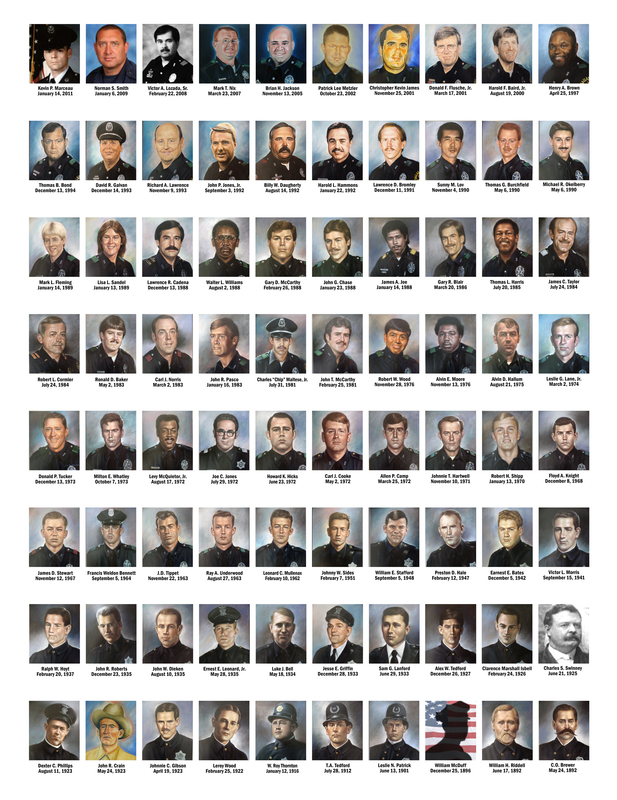 In recognizing our fallen comrades, we also honor the past and present men and women of the department who have worked tirelessly to provide a safe environment for the citizens of Dallas. On Wednesday May 18, 2016, the Dallas Police Department will hold services honoring the 2016 Police Memorial Day. This event recognizes the sacrifices made by Dallas Police officers as well as other officers who have given their lives in the performance of their duties. Listed below are the order of events and a brief description of the service. 11:50 AM – March to the Memorial Griffin St. at Young St. to Griffin St. and Akard St.
All former or current police officers, family and/or friends and citizens are invited to join the Dallas Police command staff, honor guard, salute team and other dignitaries in marching from Griffin and Young Street to the Police Memorial site at Akard and Young Street. Free parking will be available in Lot-E located at 600 Memorial Street (Memorial and Hotel). 12:00 Noon – Dallas Police Memorial Service – Young St. and Marilla St.
Service includes a performance by the Dallas Police Choir, the reading of the “Roll Call of Honor”, 21-gun salute, Taps and a fly over by the Dallas Police Helicopter. In the event of inclement weather, the ceremony will be moved to the lobby of Dallas City Hall located at 1500 Marilla. The Texas Peace Officers’ Memorial Foundation was formed in 1987 and started to raise money to build the Memorial and offer services. In 1998, a little over 10 years the Foundations to able to convince the legislature to authorize the Memorial and began construction. It wasn’t till May 10, 1999, when the law enforcement officers and the families of officers traveled from all over the state of Texas to the City of Austin for the Memorial dedication. Since then, the foundation’s determination to preserve the rich history of Texas law enforcement and provide assistance and support for the families of the fallen officers has remained unequalled. Combined Law Enforcement Associations of Texas, also known as CLEAT, is the founding sponsor of the foundation, which is funded solely by contributions. The Memorial is located on the grounds of the Texas Capitol, easily accessible from Congress Avenue and 15th Street intersection. To honor those who serve as law enforcement officers, congress created the Peace Officer Memorial Day in 1961. President John F. Kennedy signed the bill into law and he designated May 15th as Peace Officer Memorial Day, and the week in which it falls in as National Police Week. In 1994, President Bill Clinton directed the American flag to be flown at half-staff on May 15th. Every year a ceremony is conducted at the Dallas Police Memorial to honor those Dallas Police Officers who have been killed in the line of duty while serving the citizens of this great city. The ceremony starts with a march that ends at the Police Memorial site. During the ceremony, the Dallas Police Choir will perform and the names of the fallen officers are read, also known as the “Roll Call of Honor.” This is followed by a 21 Gun Salute, the playing of Taps and the Dallas Police Helicopter, Air1, will complete a flyover. At the end of the ceremony, family and friends may place a yellow rose by the name of his or her loved one. In 1892, Officer C.O. Brewer became the department’s first officer killed in the line of duty. Since then, the Dallas Police Department has lost 80 officers. The most recent officer added to the Memorial was Kevin Marceau. As the Department reflects on honoring all law enforcement officers during Police Memorial Week, we would like to extend a special thanks to our officers for making our city safe. We hope and pray that no other name is added to the Memorial. On Wednesday May 14, 2014, the Dallas Police Department will hold services honoring the 2014 Police Memorial Day. This event recognizes the sacrifices made by Dallas Police officers as well as other officers who have given their lives in the performance of their duties. Listed below are the order of events and a brief description of the service. Service includes a performance by the Dallas Police Choir, the reading of the “Roll Call of Honor”, 21-gun salute, Taps and a fly over by the Dallas Police Helicopter. Officer Leslie Lane was shot and killed with another officer’s weapon while attempting to arrest an abduction suspect. The man had abducted an off duty female officer. She was able to escape the man, but he stole her weapon and fled. He abducted another woman before leading officers on a car chase. The second woman escaped when he crashed and as officers attempted to arrest him he shot at them, fatally wounding Officer Lane. The suspect was later killed in prison. Officer Lane had been with the agency for four years. He was survived by his wife and son. Officer Leonard Mullenax was shot and killed while on an undercover operation to buy illegal alcohol. During the purchase a struggle ensued and Officer Mullenax was shot three times by the suspect. The man was not indicted for the murder because there were not enough witnesses. Officer Mullenax had been with the agency for eight years and was survived by his wife and daughter.